This product was replaced by a updated version Motor Shield V2.0 (SLD01102P). 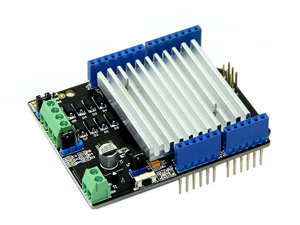 The Motor Shield is a perfect platform for robotics and mechanical applications. It enables the Arduino to drive two brushed DC motors or one 4-wire two-phase stepper motor. Based on the H-bridge driver Chip L298N motor driver integrated circuit, it requires a 6V to 15V power supply to power the motor and also includes an on-board 5V voltage regulator for powering the main Arduino board. Additional plug and play Grove sensors can be connected to the 13 on-board Grove connectors. The Driver IC and Heat sink may become very hot when working with current more than 1000mA.